I'm supposed to like these, and I do! A cluster of berries after (or was it during?) a recent rain. I will write some highly judgmental commentary in a future blog post. 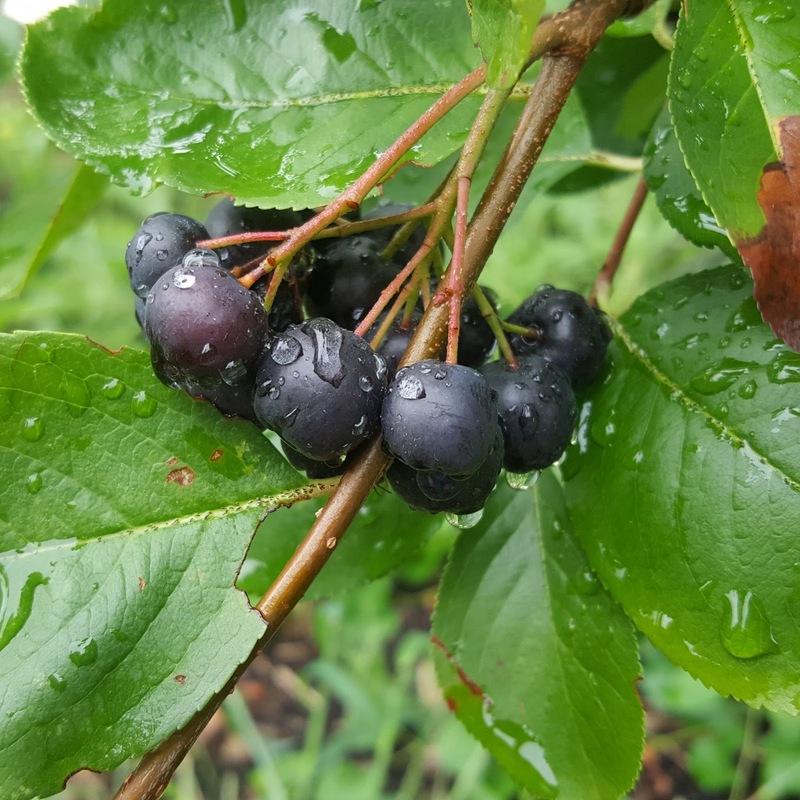 For now, though, I'd like to introduce you to one more that seems to come up in permaculture conversation - aronia. It's a dark blue/purple berry that has the unfortunate common name of chokeberry. I don't hear people say "I'll have a chokeberry pie for dessert" very often. Indeed, the fresh berry is tart, "dry," even a little astringent. In fact, here's an entire article about how they taste. At first I found them to be as described, dry (not moisture, but the mouth feel) and a little bitter. But after eating them a handful at a time over a few days, I started to enjoy the flavor. This bush, planted in our front yard four years ago, had been slated to be moved this autumn to my community garden orchard (where all things I don't want end up). But after munching on the berries for a few days, I've now decided to keep the bush. And then there's the "good for me" argument. 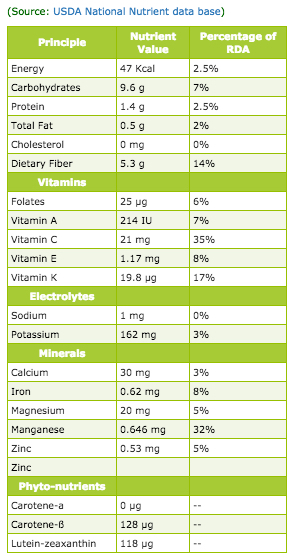 Apparently these babies are loaded with good stuff, including lots of antioxidants. I got just a few cups of berries off the bush this year. I froze them on a cookie sheet and then put them in a resealable bag. My plan is to add a few to smoothies throughout the winter. Jay, Matt and I set aside a summer Saturday afternoon to once and for all get rid of the remaining rat. 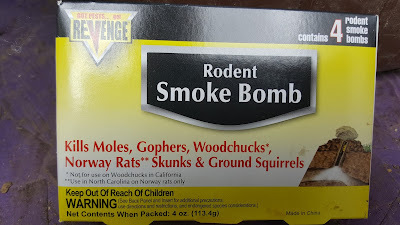 I had purchased a pack of four smoke bombs and a large bucket of poison blocks that were developed to kill rats resistant to blood-thinning poisons mentioned in Rat #4: biology basics, what’s in rat poison and UW-Madison. The first thing we did was take a close look at the situation. 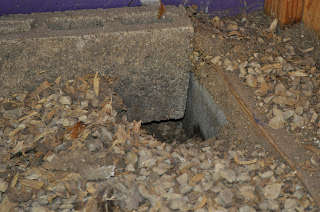 The rats had done a lot of excavation from under the coop storage area and around our garage. 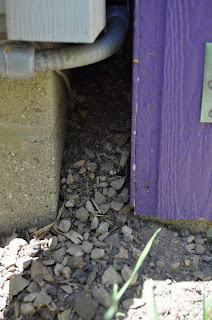 As they dug tunnels under the coop, they moved a large amount of sand, gravel and wood chips into a three-inch space between the coop and the side of our house. When peering into this small, dimly-lit space, we could see excavation piles and the entrance to at least one tunnel. Excavation around loose soil around our garage. under the coop to make tunnels. Excavation and tunnel entrances inside the run. Next, we put our heads together to figure out how to catch and kill the rat. Matt set a live trap up at one entrance to the three-inch space between the coop and the house. I blocked the other side of the space. Then we covered one of the tunnel holes with a rock and lit a smoke bomb and put it into the tunnel. 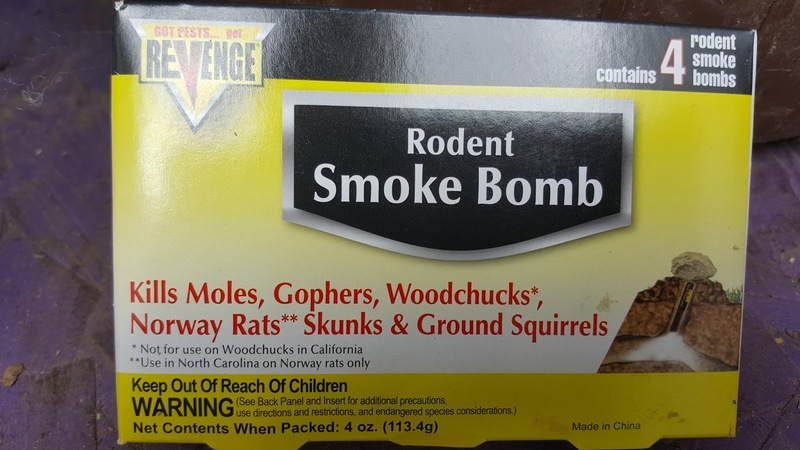 The smoke bombs can do two things; chase the critter out (into our live trap) or kill it with noxious gas. While I don’t know if it's the same stuff, but when we lit the bomb, it smelled like the same smoke after lighting fireworks. 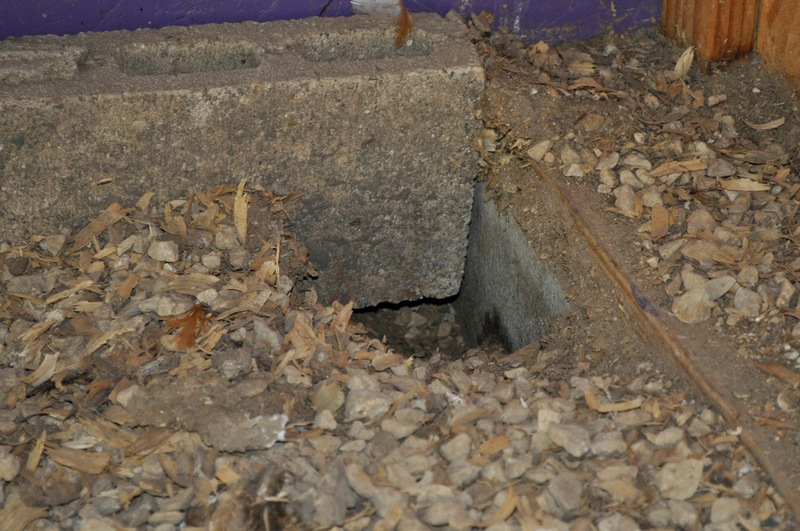 In our case, we flushed the rat out, it suddenly appeared in the run, scampering about in circles until it darted into one of the holes in a cement block that was on its side. The block was pushed up against the foundation of the coop, so there was no exit, and I quickly put a flat shovel in front of the opening. Got it! Now, what to do? Jay, Matt and I steeled ourselves to kill it. We each had a shovel in hand and prepared (mentally and got ourselves into position) to smash it. It would be a bit gruesome, but it would be done. I moved my shovel and, nothing. I looked in the space and the rat wasn’t there. We moved the block and saw that there was a tiny hole in the the foundation that the block was next to. The rat had squeezed itself into the hole and was again under the coop. That was maddening. We lit off two more smoke bombs but never saw it again. We don’t know if the subsequent smoke bombs killed the rat, but we also couldn't figure out how to get to it without moving the entire coop. So we got out weapon #2, the bucket of poison cubes. We put them in the holes, between the house and the coop, and for extra measure, I put them in some somewhat sheltered areas around our garage. Satisfied that we had made the environment inhospitable (smoke bombs, closed up tunnels, and lots of disturbance) we also committed to removing its food source. 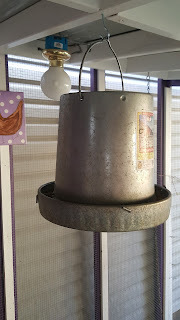 We added a hook to the roof of the run and each night when we lock the chickens in (something we do anyway) we also remove the food from it’s low hook and put it up so the rat can’t get to it. In the morning when we let the chickens out, we put the food down again. In this way, we hoped to make our coop a very unpleasant place to stay. The next day I peered between the coop and the house and one of the poison cubes Jay had thrown there was gone. Apparently we didn't kill it with the smoke bomb, and the rat gathered a free meal. Over the next few days I monitored the coop and surrounding area for holes or new tunnels. I also put a rat trap at the entrance of the space between the house and the coop in case it wanted to venture out. We haven’t seen any new evidence of excavation. night to remove the rat's food source. So, in sum, we physically killed one rat, and saw another. After our smoke bomb adventure and adding new poison cubes, we haven’t seen new evidence of the final rat. I think we’re done with our problem, but we have several lessons learned. Rats are smart. They won’t fall for the same trap more than once. Rats can get through the smallest hole. EVERY hole needs to be sealed up. We must be vigilant and not nearly as nonchalant as we had been when we first noticed them. It’s good to talk with neighbors – Jenny and I formed our own little rat support group to talk about our frustrations with getting rid of them. 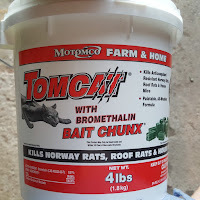 As I said in Rats #1, I first noticed the potential for rat inhabitants in or near our chicken coop and made a half-hearted effort to get rid of them. I did get one right away in a physical trap, but next door neighbor Matt had seen two, and the evidence was clear that the second one was still hanging around. I don’t recall how it started, but shortly after discovering our own rat problem, my two-doors down neighbor, Jenny, stopped over and in a hushed tone asked if we were having any rat issues, and shared that she had them in her compost pile and around her chicken coop. Jenny may not have actually whispered the news, but we both agreed that rats and chicken coops don’t seem to be talked about much. 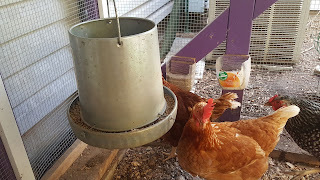 Jenny knew we were going to be on the Mad City Chicken coop tour in a few weeks, and dared me to bring up the topic of rats and coops as people visited our setup. In hindsight, it’s interesting to note that in anticipation of the coop tour, Jay and I cleaned out the coop and the run and conveniently wiped out any trace of the rat tunnels in the floor of our run. Even before Jenny’s dare, looks like I didn’t want to talk about rats either, and was quietly going about my business to get rid of them. On Madison’s news and neighborhood internet sites, there’s been talk about an increase in the rat population on the city’s east side where I live. See this June 14, 2016 story. Some suggest it’s due to increased chicken coops, and from my experience, I can’t deny that’s a likely factor. I did a quick search and found that the best things to do are keep grasses around coops and buildings clipped short enough to expose holes, remove sheltered areas for them to hide like piles of stuff against buildings, removing food sources and thorough extermination programs. 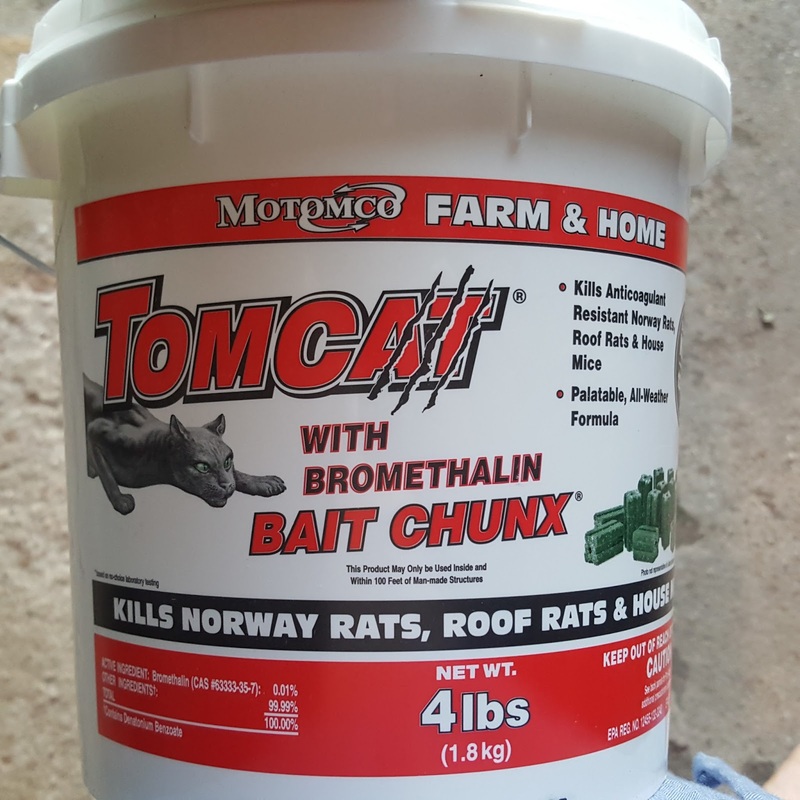 From the June 2016 news article linked to above, Doug Voegeli, Madison Dane County director of environmental health, said "It's not just a single entity that is causing this infestation, it's the whole area that is providing adequate food, adequate water and shelter for these rats." I guess that makes all of us partially responsible if we see evidence or inadvertently provide shelter and don’t do anything about it. 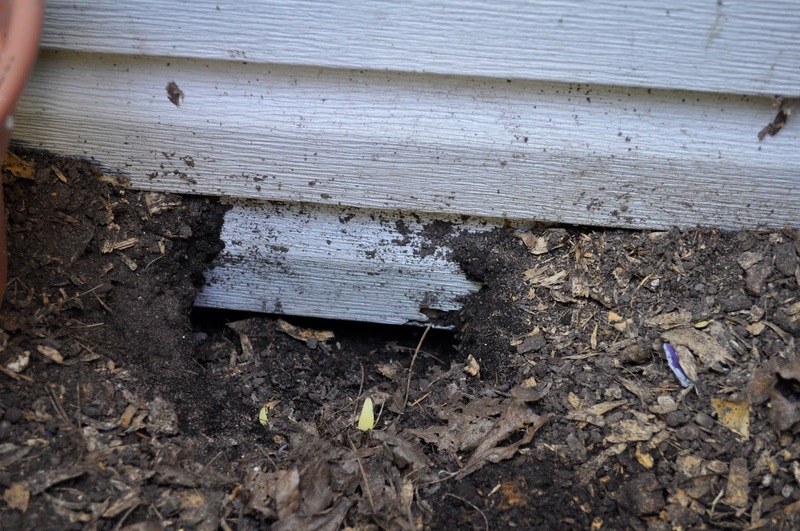 In addition to removing shelter, disturbing hiding places and poison or traps, for those who keep compost piles, it’s important to turn them regularly, disturbing any rat habitation. In fact, now that Jenny and I are talking about rats, we share success stories. She was turning her compost pile and found a nest of five babies and she was rather proud of herself for dispatching them. In the next and final entry in this series about rats I’ll detail how three grown men using smoke bombs, shovels, traps and poison took care of our rat problem at The Eggplant.